There’s no doubt about it, Mark Waid gets Daredevil. You’d have to in order to take a book that’s been headed down a particular path for so long, successfully turn it around and get it moving in a whole new direction yet still have the character sound and act like himself. A more take charge, positive self, but still, at his core, the same character many of us have known and loved for so long. In this issue, we see the most recent three-issue arc come to a very satisfactory close that’s ripe with storytelling potential for the future, but which doesn’t exactly force a particular development that has to be followed up on immediately. What this issue also does is showcase something that I’ve been wanting to see more of for a long time: Daredevil using his sharp intellect as much as his fighting prowess to get himself out of a tricky situation. Matt is a smart guy and a gifted negotiator and kudos to Mark Waid for thinking of bringing Matt the lawyer into Daredevil’s world as a balance to the natural place the Daredevil persona has often had in Matt’s professional life. This also marked Marcos Martín’s final arc (at least for the time being), and he goes out on a high note. The comic book medium has a lot in common with movies in that it provides a perfect way to both show and tell the readers what’s happening. But comics has the added bonus of being able to use the two dimensions of the printed page and the way the panels are arranged to do some really cool tricks and Martíns ability to use the medium to its fullest has really been what I’ve enjoyed the most about his art. The below scene is a perfect example of what I mean. We also get to see Bruiser fleshed out a little more this issue and Waid provides some fantastic details to show us just what a peculiar yet “with the times” character he is. It’s not only the shirt covered with logos of his preferred would be employers, but we learn that he’s got a website detailing his conquests. Of course, he’s got a website! It just seems natural for an obviously attention-seeking character, doesn’t it? The fact that his obsessions are so clearly reflected in his outer appearance also makes him something of an enigma for Daredevil who (not being able to see the logos) is clearly puzzled by Bruiser’s talk of sponsors. I’m not really sure I buy the particulars of Bruiser’s power set (how do you shift your center of gravity without actually shifting your mass around?) but it makes for an interesting fight that Daredevil has to win by outsmarting his opponents and using the means available to him rather than through brute force. 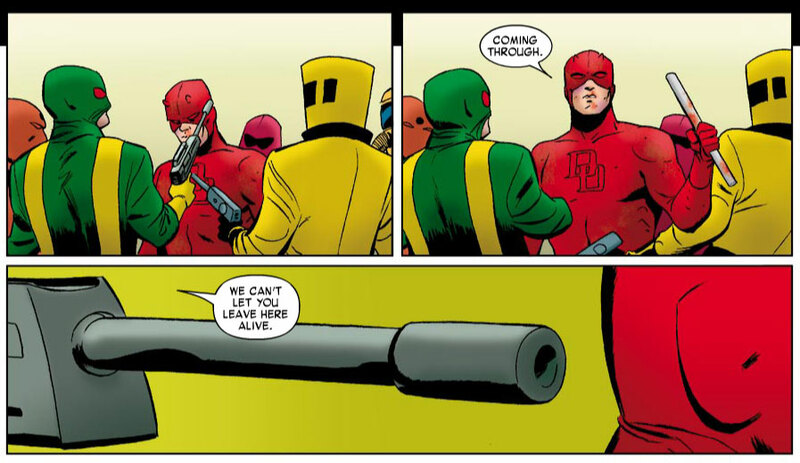 Of course, this is only the prelude to the real stand-off with some of the most dangerous terrorist organizations in the Marvel Universe where Daredevil manages to talk his way out and walk away with what would have to be their most coveted prize. As fantastic as this series continues to be week after week, I did feel that Daredevil #6 failed to live up to the heights of Daredevil #5 if only because I would have loved for the final scene – after the stand-off and with Matt back in New York – to have been a little bit longer. This entire issue pretty much consists of a single extended sequence and, while supremely well done, failed to cover as many different bases as we saw in issues #4 and #5. Compared to the final issue of the first arc, there is less “Matt time” at the end and as someone who cherishes the out-of-costume scenes as much as some fans absolutely need their in-costume scenes, I would have liked to see more. However, that’s a minor complaint, particularly given the role of this issue in the entire arc and the series thus far. Two thumbs up to everyone involved in this issue! And, after having to wait five weeks for this issue,the next one is only three weeks away. I can’t wait! I really have to resist reading this review now… I get my comic once a month and now I have to wait for three weeks on this issue :-(. I love after reading a synopsis online for this issue that Mark picked up on sound travelling faster in water, but can’t wait until he addresses the noirish rain previously embedded in Daredevil stories that would in fact have hampered Matt’s echolocation. Mark could make good use of this by having DD’s perception of echoes slightly improving in NY’s wintery weather or after rain, since sound waves tend to travel better in cold air, and wet objects tend to reflect more sound energy. Mark also needs to address Matt’s cowl, since hoods, etc. can strongly interfere with echolocation, a strong signal will not help under these conditions.